As mentioned, the game-changer in Queens is that you can buy the dungeon back-floor keys (Flapping Fish) from Ruty's shop. In fact, it's much more efficient to sell any bait you find, buy some Flapping Fish and an Ice Block, and hit the back floor of B16 than it is to go fishing now, so take advantage of that. You'll usually get 1-2 gems per trip, and you can squeeze in two trips in about 15 minutes. 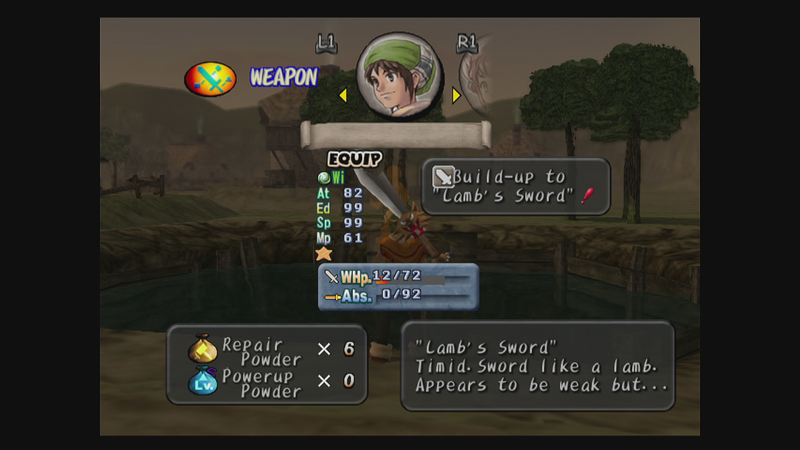 We start by getting Toan's sword upgraded to the Lamb's Sword, which has the odd property of having lower attack power when at high WHP. 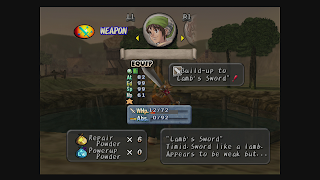 When it gets low, however, it becomes the "Wolf's Sword" and its damage skyrockets (enough to one-shot most enemies in the Sunken Ship). 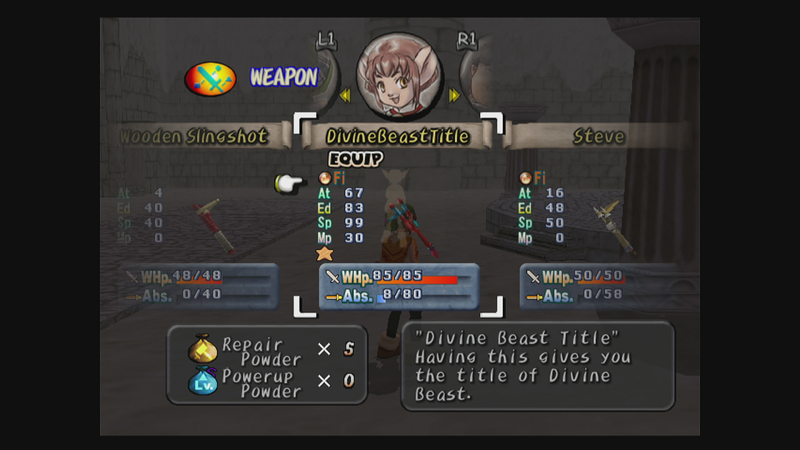 Xiao's Double Impact was upgraded to the Divine Beast Title. Not much to say about it, but she does more damage now and that's never a bad thing. Plus it's one step closer to her ultimate weapon! 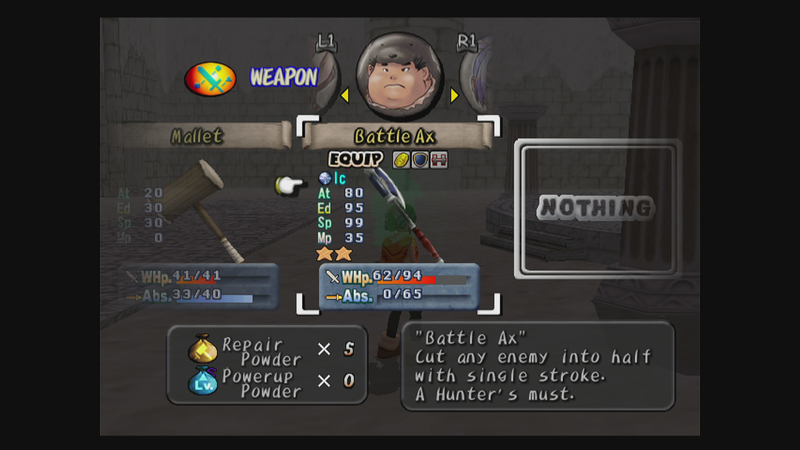 I upgraded the Trial Hammer to +5 and Synthsphered it, which got folded into the Big Bucks Hammer, which in turn was folded into my Turtle Hammer and gave it the boost it needed to turn into the Battle Axe. 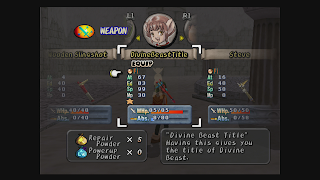 This also lets me carry over a few choice attributes of those weapons as well; namely Big Bucks, Durable and Abs Up. The last of the three is especially important as it will reduce the amount of grinding I will have to do with him later! Of course, getting more gold and having to use less repair powders is no bad thing either. 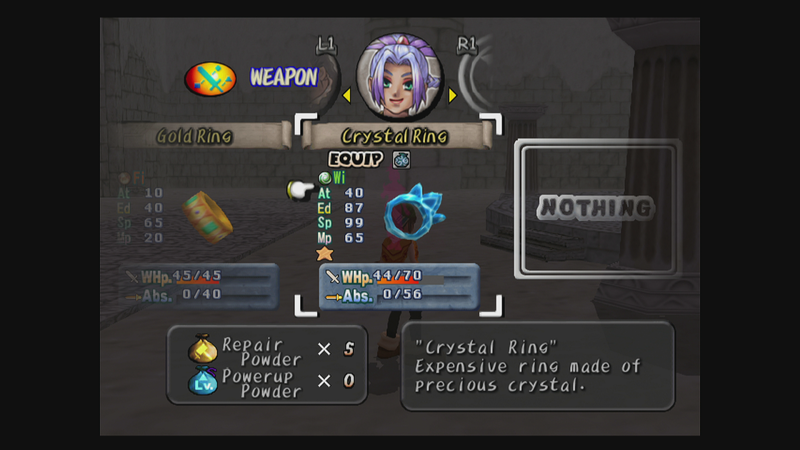 I did the same thing with Ruby, upgrading her Bandit's Ring to +5, Synthing it and attaching it to her Platinum Ring to put her over the top for the Crystal Ring. 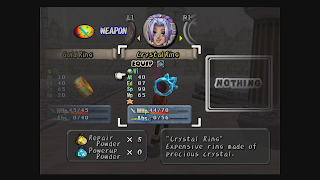 Said ring also inherited the Bandit Ring's Steal ability, which means I can swipe items from enemies as well to provide a steady flow of cash. Very useful indeed. 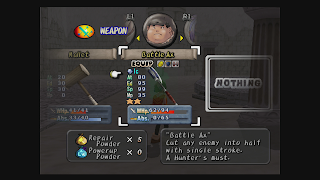 Moreso when you're grinding gems on B16 of the Sunken Ship, as Mimics have stealable Repair Powders and Big Mimics have Escape Powders, which allow you to level up your weapons indefinitely and make a quick escape for another run-through, respectively. 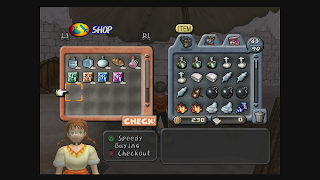 Something else I didn't note at the time is that Suzy's shop name change actually affects her inventory. 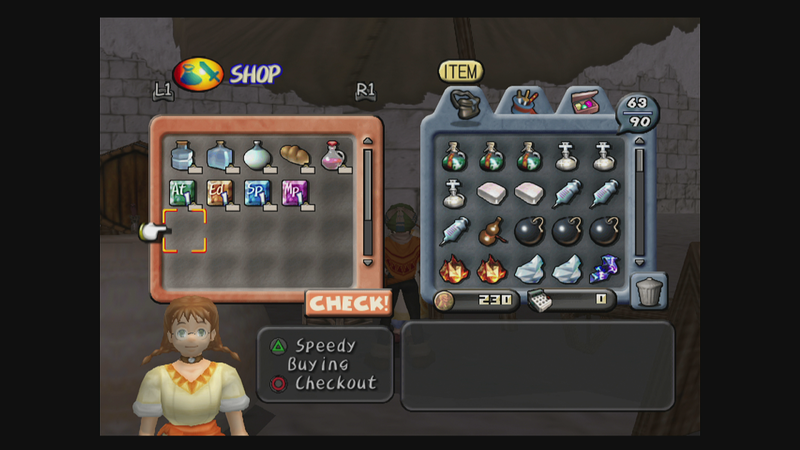 The best option to pick is "Freshen Up", as she will begin stocking Attack, Endurance, Speed and MP +1 items. 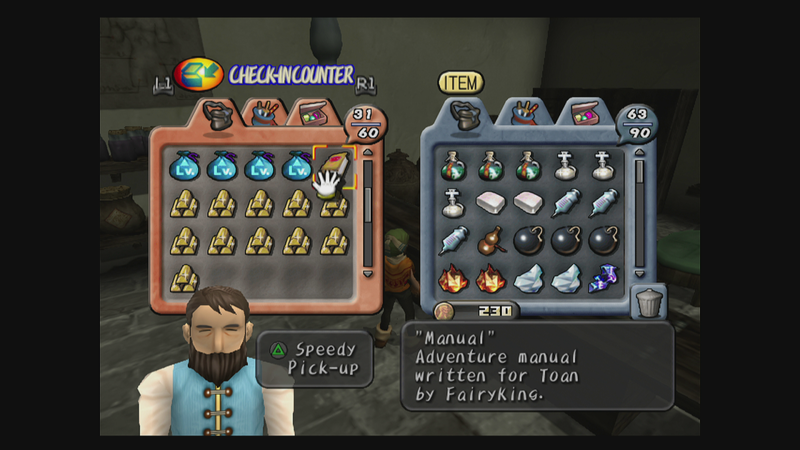 The latter two can't be bought anywhere else save for the shop just before the final dungeon, so it's definitely worth picking option 1 just for that! In the course of all this leveling up, I also collected plenty of cash and salable items. Which means I've got a solid hoard of gold for later!